Pothgul Vehera is located in the Polonnaruwa District of North Central Province, Sri Lanka. The Sinhalese name “Pothgull” has the meaning of “place to store books”. As such, with the other historical evidence, this ancient place has been identified as the oldest Buddhist library complex in the country. It was built by the King Parakramabahu the Great (1153-1186). This was a 7 storeyed building with about 1000 rooms, built by the King Parakramabahu the Great (1153-1186). It is located in Polonnaruwa District of North Central Province, Sri Lanka. This place is considered to be the Palace of King Parakramabahu the Great. The Palace was called as Vijayotpaya or Vijayanta Prasada (the name of the Palace of God Sakra). 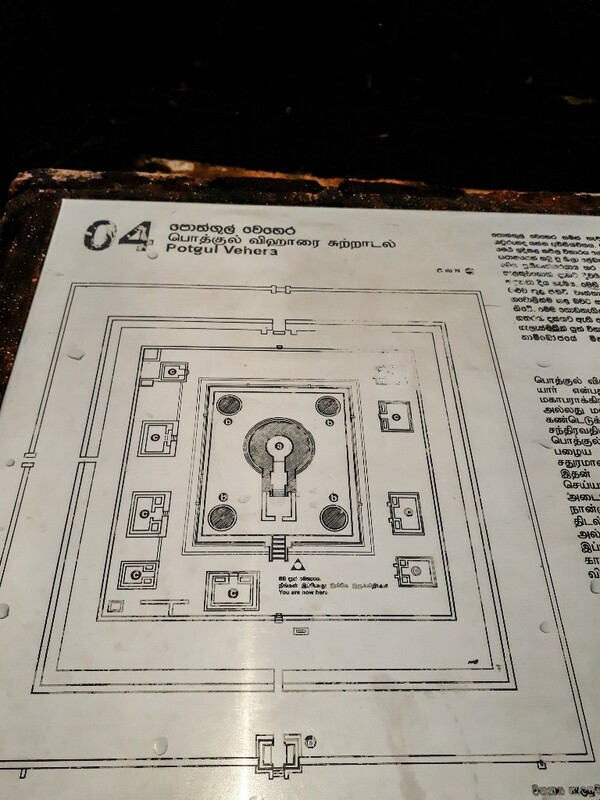 Since it has consisted of 7 stories, the building also called “Sathbumupaya” (in Sinhala). The remaining huge walls with thickness over one meter and part of stairs and the foundation walls give you an idea about the size of the building. The large holes which can be seen in walls probably the places where the large wooden beams fixed. The Palace may have been destroyed by fire during the invasions. In addition to the main building, there are ruins of some minor buildings around it. This site is also listed as a UNESCO World Heritage Site. This pond or royal bath is presently known as “Kumara Pokuna” is believed to be the Pond named “Sila Pokkharani” mentioned Mahavamsa. The pond is located next to the Council Chamber of King Parakramabahu in Polonnaruwa District of North Central Province, Sri Lanka. According to Mahavamsa, the pond was built by King Parakramabahu the Great (1153 – 1186 A.D.). The pond is located such a way that it can get water from the Parakrama Samudraya tank and it has provided with outlets to drain off the used water. The water was supplied to the pond by the two dragon mouths located both sides the staircase. It is quadrangle shape and there is lotus flower in the middle. The pavilion near the pond may be served as a changing room. This building has been identified as the Council Chamber of King Nissankamalla (1187 – 1196 A.D.). An inscription on the lion figure made of the stone itself identifies as the throne of the king. And the inscriptions on the pillars indicate the seating arrangement of the respective ministers and state officials. This Council Chamber is located in the Dipauyana premises in Polonnaruwa District of North Central Province, Sri Lanka. You can access it through the Archaeological Museum or by the footpath (Royal Palace Pathway) which is starting in front of the entrance to the main archaeological site. 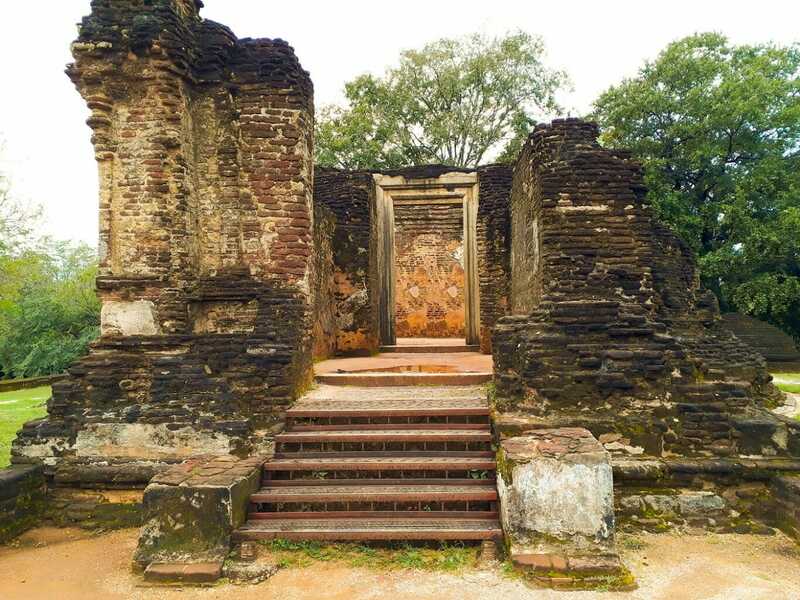 This Hindu Shrine is located in the archaeological site of Polonnaruwa, in North Central Province, Sri Lanka. The ancient name or the builder of this shrine is not known. However, according to the style of architecture, this may belong to the 13th century A.D. This image house is located in the Dalada Maluwa premises in Polonnaruwa District of North Central Province, Sri Lanka. Although it is known as Thuparama Image House, the ancient name or the builder is not known. The image house is categorized as Gedige type as its walls and the roof is completely built with bricks. This is the only monument among those in Polonnaruwa where the roof is well preserved. A large seat thought to be the base of a giant seated Buddha statue can be seen inside the image house. The ornamentation of the exterior walls shows the influence of the South Indian architecture, vimana-panjara-kudu design.